John Steinbeck published The Pearl in 1947 as his 11th novel. The American writer’s best asset is that he writes only after experiencing his subject matter firsthand. The novel is a parable inspired by a Mexican folk tale of a young Indian pearl diver that Steinbeck had heard on his trip to Mexico. 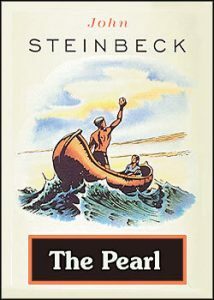 Steinbeck increases the depth of the folk tale to bring forward a parable with a valuable moral story to be taught throughout the many years to come. The Pearl is a story of greed, evil and materialism narrated by the natives of the land. It is the story of the Mexican Indian pearl diver Kino and his family who live a primitive lifestyle in a brush house in a village in La Paz, Mexico. Although poor, the family live a content and peaceful life up until their son is poisoned by a scorpion and needs medical attention that only people of great means can afford. The answer to their prayers is ‘The Pearl of The World’ that would achieve their hopes and dreams. But with Kino’s newfound riches comes the greed and evil of all those around him as well as Kino’s own greed and ambition. Greed disrupts the harmonious nature of the village people who see their own hopes and dreams fulfilled in the pearl. As Kino fights off the envious and evil who surround him, he is unable to reach his happy ending. The novel ends with Kino committing murder in self-defense to protect the pearl, Kino’s valuable canoe that was passed on from generation to generation is destroyed, their home is burned to ashes and their baby Coyotito is shot in the head. Kino and his wife Juana dispose of the pearl but only after it disrupts their entire life. In essence, the moral of the story is that money cannot buy happiness, and that greed is a corruptive force that consumes one’s soul. The reason why Steinbeck’s novel is still taught in schools to this day is that beyond its literary richness is a valuable lesson and a relatable story of the good and evil in the world.